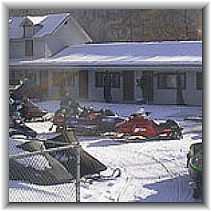 Christy's Motel - Old Forge, NY - Lodging in the Adirondack Mountains of New York State. 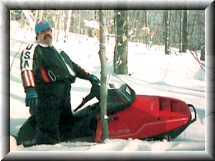 "Adirondack Home Away From Home"
The Old Forge, New York area is a popular vacation destination all seasons of the year. The Enchanted Forest/Water Safari in the summer, breathtaking fall foliage on The Adirondack Scenic Railroad in the fall, snowmobiling on the Town of Webb snowmobile trail system during Snodeo Weekend and all winter long, and class V white water rafting on the Moose River in the spring are just a few of the many attractions the area offers to its visitors. Christy's Motel is centrally located on Main Street in Old Forge, New York and offers a family oriented atmosphere to its guests. We offer spacious accommodations with either one queen bed, two double beds, or an efficiency unit. We have all non-smoking rooms, a handicapped accessible room and rooms with refrigerators. All of our rooms have free WIFI, air conditioning, self controlled heat, in room phones with free local calls and all of our motel rooms feature 27" cable TV. The Old Forge, NY area offers many attractions and activities for you and your family, on the vacation you have been thinking about taking or on a get away weekend. Relax on the front porch of your room and have a cool drink as you watch the children play at our children's play area. You may also enjoy taking a swim in our heated outdoor pool*. Within walking distance are many fine shops, restaurants, and a miniature golf course. Located across the street, is a Fastrac convenience store for a snack or those items you forgot. The Old Mill Restaurant , voted by snowmobile riders as one of the best places in the east to eat, is only a short walk away. For additional information about lodging or the Old Forge area. All of our rooms are smoke and pet free. Stop back in the future, to see what's new on our site. Just like our rooms, it's always being renovated and upgraded to better serve our guests. Pool is open from mid to late June (depending on weather) to Labor Day.